1mm wide ; compact rounded habit; height 75-100cm; spread 75-100cm.. Collected by D. J. Small between Casa Vegas and Hotel Formentor, Cap de Formentor, Mallorca, Balearic Islands, on 19 December 1984. Hardy; surviving –8ºC without damage. Registered 31December 1997: D. J. Small, Denbeigh, All Saints Road, Greeting St Mary, Ipswich , Suffolk IP6 8PJ, England. Flowers in 3s in leaf axils; corolla white, narrow-urceolate, to 4.5mm long, c. 2.5mm diameter (c. 1.5mm at throat); anthers dark brown, exserted a little; calyx and pedicel white; II-V; upright shrub, 0.5(-l)m tall; foliage glossy, dark green.Seedling raised probably in the late 1980s or early 1990s by John R. Tucker (d. July 2006) (Worthing, Sussex); subsequently propagated vegetatively. The origin of the seed is uncertain: it was said to have come from South Africa, which is highly improbable. 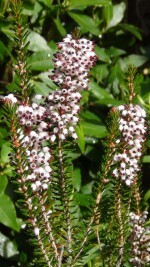 The plant was originally labelled "Erica longifolium", but subsequently identified as Erica multiflora. Established here. 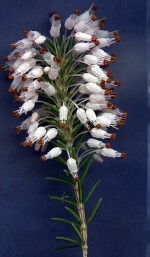 Registered on 1 October 2006 by The Registrar, The Heather Society.